Looking for a heavenly bouquet of orange and vanilla to fill the Christmas house? Bake these biscotti! You have to make the song your own, they tell contestants on talent shows like X-Factor. What goes for a song, also goes for a recipe. Either you make up your own, or you make it your own. These days it’s not easy to invent a recipe. There are thousands of biscotti recipes to be found, in all shapes and tastes, with all kinds of ingredients and baking methods. So you find a basic recipe, test it in your oven, under your conditions with your specific types of ingredients and then make a version you like the most. 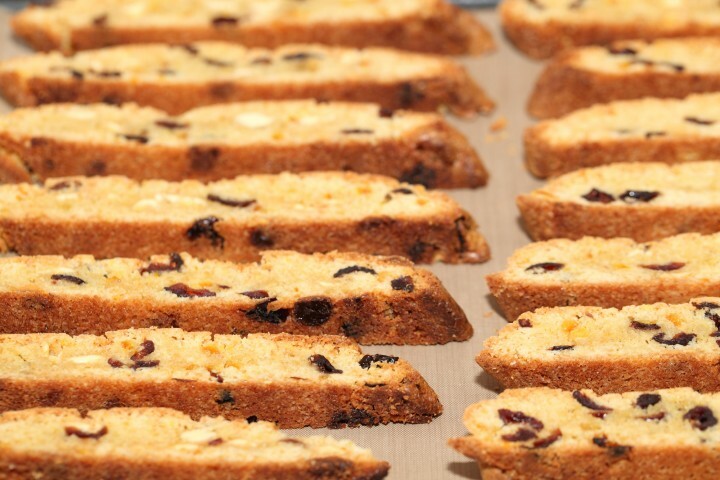 Some biscotti recipes have lemon or orange zest in them. A wonderful flavor of course. I had been playing about with my home made candied orange peel recently. Cover them in chocolate, add them to cakes and muffins, use them as decoration. So why not shred them and add them to my biscotti recipe? I am quite in love with the result. Candied orange peel seems even more orangy than orange zest and the shredding takes care of an even distribution in the dough. The perfume is heavenly! Whisk together flour, baking powder and salt in a medium mixing bowl and set aside. In the bowl of an electric mixer fitted with the paddle attachment or using a hand mixer, beat together sugar, melted butter, egg and egg yolk and vanilla extract on medium-high speed until well combined. Reduce mixer speed to low and add dry ingredients. Mix until just incorporated and then stir in white chocolate chips, dried cranberries and shredded orange peel with a spatula. Shape the dough into a 30 cm x 7.5 cm / 12″ x 3″ rectangle on the baking sheet prepared with parchment paper. Bake until golden brown, about 30 minutes. Remove from oven (leave oven on – you will need to bake the biscotti again) and let cool for 30 minutes. Carefully transfer the rectangles to a work surface and remove the parchment paper from the baking sheet. Using a serrated knife, carefully cut into 1.2 cm / half-inch slices on the diagonal. Place slices on the baking sheet. Return to the oven and bake for another 10 minutes, turn and bake for 8 minutes. Transfer to a wire rack to cool completely. Store in an airtight container. Biscotti keep for about one week and can be stored really well in a freezer for up to two months. I want to make biscotti early for Christmas. You say it freezes well. Do you completely cook as the instructions and freeze cooked or do you have other advice? We do completely cook them before freezing (so no par bake) and it works well for us. We do not have experience with any other method, but we would advice always to try with a small batch first and see how it turns out. BISCOTTI! I’ve been on a biscotti baking bender this past week. In the ’80’s a woman from San Francisco introduced Americans to biscotti. Her biscotti di Prato (no butter or oil) was very light with a wonderful crunch. While delicious, they weren’t for dunking–even a quick dunk caused her biscotti to fall apart. A chunk of soggy biscotti floating in my coffee was not very appetizing. I’ve been on a quest (obsession is probably more accurate) to create a biscotti that is light, crunchy, bursting with almond and orange flavor–and substantial enough to dunk. I’m going to try your flour to fat ratios. I’ve experimented with whole eggs and extra yolk; beating egg whites to soft peaks; less yolk, more whites; and in the third batch I baked today, eggs and butter. Each batch gives me a few characters I absolutely love, along with a few I dislike. Some issues I think are flour selection. So I’m experimenting with mixing all purpose flour with some white spelt (with some bran and germ ) and almond flour. Spelt for color and nutty flavor; almond flour for flavor since I really disliked the almond extract. I use orange zest, but I like your use of candied orange peel. Such an elegant approach to flavor. I’m going to give that a try. Thanks for sharing this info about your quest. So many variables and endless possibilities. Hope you crack the code and end up with your perfect biscotti.